To J.Y. Bamboo Chinese, Japanese, Thai, Vietnamese Restaurant, Fairborn, OH 45324. 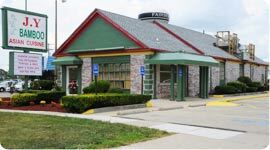 Located at 609 N. Broad St. Fairborn, OH 45324, our restaurant offers a wide array of authentic dishes, such as Miso Soup, Tuna Tataki, Egg Roll, Pad Thai, Sushi, Sashimi. Try our food and service today. Come in for a Chinese Lunch Special or during evenings for a delicious Authentic dinner. You can also online order your favorite food for take out or delivery.